Prev Kid-Friendly Activities At Your Door Next Sea Shell Printable! 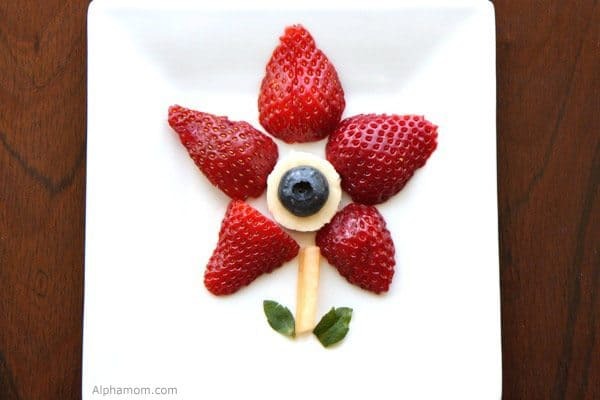 Your child will love combining a fruit snack with craft time to make these fun fruit pictures. My kids were so excited and thought this treat was so special, they couldn’t wait to devour them! One part of summer that I most look forward to all year is the fresh fruit such as delicious strawberries, melons, and blueberries. 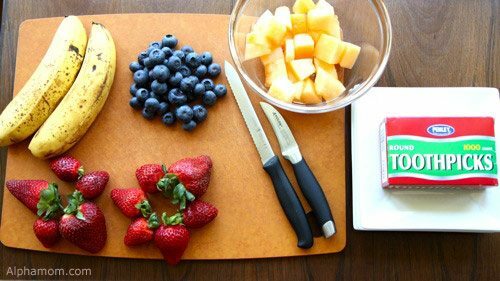 We kept it simple with these familiar foods, but this activity would also be a neat way to introduce new fruits and vegetables to your child. 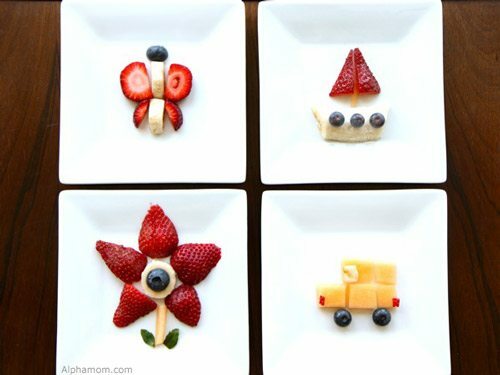 Of course, if your child is young I recommend that you handle the sharp knives to cut the fruit, and he or she can arrange all the shapes on the plate. A standard paring knife is really the only tool needed, and that’s what we used so these pictures could be made in everyone’s kitchen, but you can get fancy if you want to and use small cookie cutters to cut unique shapes into the melon slices. The toothpicks are optional for your child to use to spear the fruit, partly for fun, but also for ease of picking up the cut fruit without smushing it. Recently during our art time, I’ve been trying to show my kids how they can make any pattern or design they want if they can see the shapes. A truck consists of rectangles for the cab and circles for the wheels. 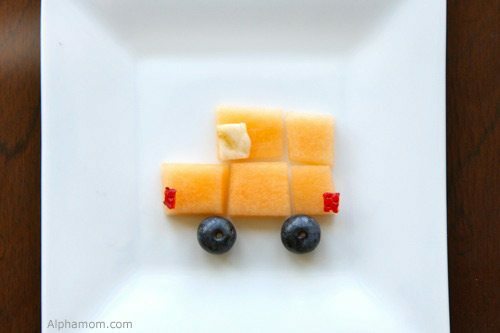 This truck uses melon cut into rectangles and blueberries for wheels. Tiny pieces of strawberry add the detail for the brake lights, and a little piece of banana makes the windshield. To make a boat, start with a wide slice of banana (cut lengthwise) for the boat’s hull, and add a sliver of melon for the mast. 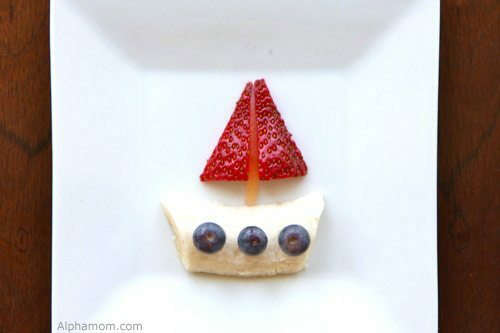 The strawberries sliced into triangles form the sails, and the round blueberries look like portholes. The blueberries are just placed on top of the banana, and the banana is soft enough that nothing else is needed to make them stay on. 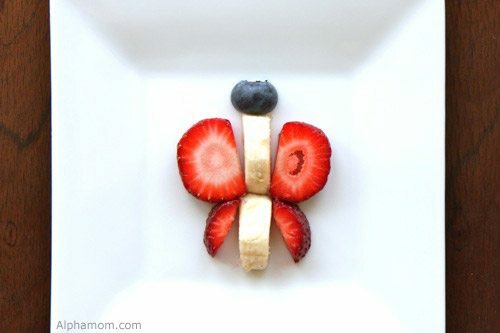 To make this butterfly, we used banana slices, strawberry slices, and a blueberry on top, but get creative and find out just how many variations you and your child can come up with! I often cut Eleanor’s sandwiches and cheese slices with cookie cutters to make cute shapes, but I love the idea of letting her get involved in making the food look cute. where do you find those tiny cookie cutters? they are so cute!